This gun comes with a standard universal nozzle which suits most general applications. This gun will work with all of Rangate's glue tanks. 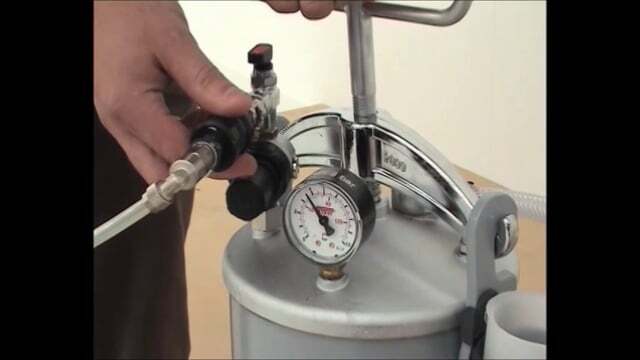 Replacement glue gun orders do not include nylon hose to connect to the tank- if you need a replacement, click here. This glue gun shares all internal components with our standard glue gun, making part replacement orders and maintenance streamlined and simple. With basic maintenance and care, the effective lifespan of your Pizzi equipment can be extended. After you're finished using the glue gun, remove the nozzle from the end and clean the gun housing with water, paying special attention to removing any glue from the threaded end area. Dried glue build-up here can make it difficult to screw your nozzle attachments on and off. We recommend checking out our handy maintenance guide for some easy tips on how to get the best from your Pizzi pressurized glue system. To order replacement parts for the pistol grip glue gun, consult this parts diagram, then order through the links in the table below.